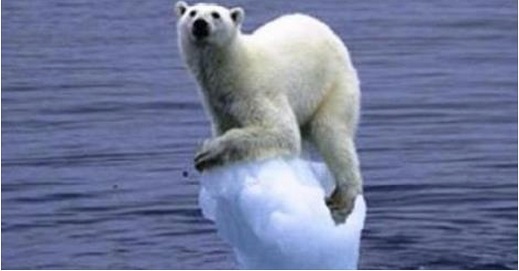 Scientists warn that the majestic Arctic polar bear is in danger of becoming extinct. As we speak, the icy white land on which these beautifully white creatures live in peace and harmony with their all white families is melting beneath their very paws. Indeed, my friends, Barack Obama is encouraging global warming so this white utopia of the North shall melt away and Earth will be a far warmer place. This sounds like such a microcosm of what Obama wants to do to all of Earth, doesn’t it? Obama does not believe in God, so he cannot fathom that God may have just wanted to invent a cute, cuddly white bear to watch from above. Obama cannot understand why God would create an all white animal to hunt in a dark ocean. If evolution is true, wouldn’t it make more sense to have a black polar bear, that could sneak into the water and hunt down seals in stealth? Polar bears represent all that the streets-raised Chicago Obama hates about life. A polar bear is a walking, breathing John Denver song. Obama cannot stand to hear anything like that, so he is using us to wipe us out. Why are gas prices suddenly so cheap? It is so he can finish wiping out the polar ice caps. Mark my words, Obama had something to do with the demise of King Abdullah of Saudi Arabia, because the King wanted to raise gas prices a bit. So what did Obama do? You’ve seen the headlines and I can guarantee, the new King will be too scared to raise the gas prices. The more we Americans drive our cars, the more these polar bears will die. We must demand gas prices go up to where President Bush had them, around a good $4.00 per gallon. At this rate, poors cannot afford to drive their high-CO2 emission hoopties around and the Earth will be more pure. But if these prices stay so low, poor people have nothing to do but use their welfare money to fill up their old cars, put out nauseous exhaust all day and to punch holes in the ozone layer, which will in turn allow the sun to fry up the polar bears natural home.